Dermaplaning is a simple and safe procedure for deep exfoliation of the epidermis. Additional benefits of Dermaplaning are ridding the skin of fine vellus hair (peach fuzz), smoothing the skins surface and increasing your product penetration. What Does a Dermaplaning procedure involve? You fill out a brief medical history, which a Para-Medical Esthetician evaluates. The skin is cleansed to remove makeup and debris. Degreaser will be applied to the skin to remove all excess oil. Dermaplaning is a simple and safe procedure for deep exfoliation the epidermis. An added benefit of this procedure is ridding the skin of fine vellus hair (peach fuzz). Dermaplaning is most often used on patients with rough or dry skin, superficial hyperpigmentation, mild acne scarring, or fine lines and wrinkles. The treatment results in a more refined, smooth, “glowing” appearance. All skin types, even the most sensitive skin types such as clients with Rosacea can benefit from Dermaplaning. A RN or esthetician who has been professionally trained can perform the treatment. Once The Vellus Hair Is Removed Will It Grow Back Thicker? No, this is physiologically impossible. The soft, fine vellus hair will grow back slowly, usually in about 4 weeks. There are two types of hair that grow on our bodies; Vellus hair is the thin, fine, soft hair that typically covers the entire body, terminal hair is the course hair that grows on the head, face in men, under arms, legs and pubic areas. Dermaplaning, laser, or any other depilatory form of hair removal cannot alter the type of hair grown in any given area. Scraping, nicks, and small cuts in the skin are possible, but rare, and can cause slight bleeding like that of a paper cut. It is very important to have a licensed esthetician who is properly trained to perform the treatment in a medical spa. 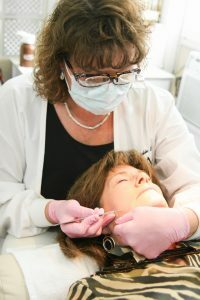 Dermaplaning is performed on the face only. You should not Dermaplane the eyelids, nose, or chest. Dermaplaning can be performed every 3 to 4 weeks for maintenance and proper skin exfoliation. For correction of acne scars, fine lines and wrinkles, and skin rejuvenation purposes, it may be performed at a closer interval. Can Dermaplaning Be Performed With A Chemical Peel? Yes. Dermaplaning is an excellent way to prep the skin for a chemical peel. Does The Skin Actually Peel From Dermaplaning? No. When Dermaplaning is performed as prep for a chemical peel the visible exfoliation that the client sees will be as a result of the peel used in the treatment. All skin types, even the most sensitive skin types such as clients with Rosacea can benefit from Dermaplaning. Men can be treated on non-beard areas only. Clients with active acne outbreaks or cold sores should not be treated until lesions are healed. Dermaplaning is great for diminishing acne scars but should not be performed during active outbreaks. Clients with bleeding disorders or difficulty clotting should not be treated. Clients with diabetes not under control by diet or medication should not be treated. Clients undergoing cancer treatment should also not be treated. No, that’s one of the benefits. The skin instantly has a healthier glow and feels amazingly soft, plus makeup glides on effortlessly for a flawless finish. This is a must have procedure before an important event!